As a series MLB: The Show has been the most consistent of all the yearly sports representations this generation. Consumers have come to rely on exceptional baseball authenticity, realistic gameplay, fantastic graphics, and deep franchise and career modes to invest time with. What has been missing though is sense of accessibility and an acceptable online experience. Those aspects however are no longer holding the franchise back. MLB 13: The Show is the iteration that pulled everything together to finally become a complete product and in doing so will absolutely deserve to be in contention for “Best Of” awards late this year. Continue on for a look at what MLB 13: The Show did exceptionally well and where it stumbled in this Hits and Misses review! The unforgiving nature of The Show has finally eased off with the expansion of the hitting timing window. Far more rewarding and satisfying, hitting success has improved dramatically but not to any sort of unrealistic level. Averages were so consistently low in the past, with too many instances of timing and placement feeling “right” but still being punished, that now it just feels far more fair. Ultimately fun factor is being impacted here to a great extent. 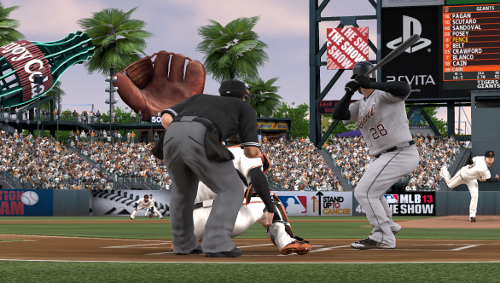 All facets of MLB 13 demonstrate improvement over MLB 12. No longer unforgiving at the plate the overall balance and variety in games has increased. Scores are more realistic and producing runs through means other than home runs is a more viable strategy. Comebacks can be made and momentum and confidence are factors. Changes to make “Guess Pitch” less of a crutch have proved worthwhile, and the new throwing meter provides more involvement and control over events in the field. Franchise mode benefits from new budgetary adjustments, scouting overhaul, and numbered player ratings. The Show is also well known for providing as many options as possible in regards to aspects such as controls, difficulty levels, and camera angles. Outside of the crowd MLB 13 shines in the graphical department. The lighting, player faces, player models, parks, and animations are all top notch. Though the PS4 will be needed to take that next step there is no discounting that MLB 13 is arguably the best looking sports game out today. Understated changes from year-to-year have gotten it to this place and, even though not dramatically different than last year, it has earned such recognition. Largely due to the increased timing window at the plate enjoyment in RTTS has expanded. The shift this year for pitchers is less evident but general gameplay balance regardless of position has been good making the experience challenging but far less frustrating. Changes to fielding cameras don’t have much of an impact, and presentation wise the focus being from a player’s perspective works in some ways and in others doesn’t fully connect. It was fine to lose the commentary but having them jump in for a statement here and there unexpectedly seems odd. The camera cuts and on-screen displays after important events within the career are great touches. Not sure what the point is to the leaderboards but they are there now. The new sim screen which allows for seeing the events take place is a valuable addition. Loading times feel as though they have been reduced. What the mode desperately needs is a form of situational training rather than expecting people to learn things on the fly by trial and error. For full online play impressions, including a comparison of statistics between MLB 13 and MLB 12 to demonstrate how significantly different it now plays, check out the earlier write-up. Though not perfect online has taken huge strides this year. Connections are more consistent and performance smoother, the opened hitting window makes the games more entertaining to play, and several smart design decisions (pitcher fatigue, Guess Pitch, matchmaking) have made the entire experience one worth seeking out. Interest in the new Postseason mode was not particularly high heading into release but it exceeded expectations. This is an appealing avenue for those people who don’t have or want to invest the necessary time within franchise but desire playing games that feel as though they have meaning. There are plenty of options available in setting up the brackets and the special presentation and ratcheted up atmosphere makes the games stand out from all the others. While the commentary is by no means poor, it has become tired, and is long overdue for an overhaul. That realization wasn’t just made this year but has been discussed as an area that needed addressing since MLB 09. MLB 11 switched out Rex Huddler for Eric Karros replacing one poor contributor for another. 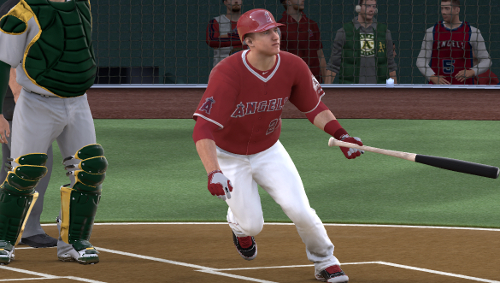 MLB 13 brings in Steve Lyons with Dave Campbell departing. Lyons’ presence is not realized all that much. The feel of the commentary, the pacing (including too much empty space) and manner in which it is threaded together, just hasn’t advanced while competition within the genre has taken major steps forward technologically and have featured complete booth changes. It is particularly disappointing within playoff games as the commentary just does not match the heightened atmosphere. Gameplay wise the frequency that the CPU throws strikes in power zones on the first pitch of each at bat, which has been well documented, is worrisome and affects strategy at the plate. There is also some sort of slowdown affecting runners as they round third base. Those few issues and an occasional stutter on pitch releases will hopefully be patched. Elements of baseball like rainouts, doubleheaders, and retractable roofs that close still haven’t been implemented. There is a growing sense that The Show has stalled as far as the PS3 goes and really needs the capabilities of the PS4 to advance any further. That’s not to say it is totally deficient in any single way, just that in playing it every year the series is showing reduced returns as far as leaps go. Areas discussed already such as commentary may fall into that category as SCEA isn’t going to make big investments in the last year or two of the current generation when they’ll be looking to totally differentiate one from the other and help to justify the PS4 next fall. This is the year that MLB: The Show finally pulled it all together to offer a complete product with exceptional value. Though it may have hit somewhat of a wall on the PS3, the PS4 providing an opportunity to break through in the weaker areas like collision detection and commentary, the changes that were made for MLB 13 still made a significant impact. The Show is a now must-have for any true baseball fan regardless of whether interest lies in Play Now, Postseason, Franchise, Road to the Show, or Online.